The 500,000th car built, less than three years after the launch, is a Tipo 5Door Sport. The Fiat Tipo Sport, developed in partnership with Mopar, is characterised by specific details that emphasise its more dynamic personality: special front bumper, side skirts, roof spoiler and rear bumper with diffuser. Available in the Street, Mirror, S-Design and Sport trims, the new Tipo range was recently launched with a new TV commercial featuring the concept “you don’t need much to get even more”. In Italy, Fiat Tipo is a key player in its segment and is in the top 10 positions in four European countries. With over 70% of units sold outside Italy, it is as well the Fiat brand’s second most global car. 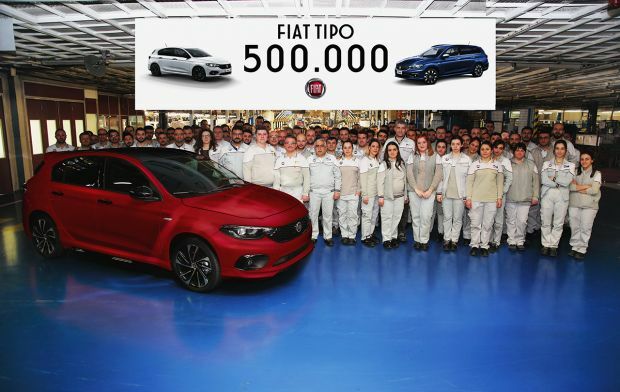 The Fiat Tipo number 500,000 was produced at the Bursa plant, in Turkey, today. Specifically, the milestone car is a Tipo 5Door Sport equipped with the 120 HP 1.6 Multijet DCT engine and featuring the striking Passion red paintwork combined with contrasting Black roof and new Total Black interior. This landmark confirms the success of the model that is a key player in its segment in Italy and is in the top 10 in four European countries, as well as being the Fiat brand’s second most global car, with over 70% of units sold outside Italy. If the units of the forerunner car, launched in 1988, are combined with those of the current version, overall output totals more than two million one hundred thousand units. In a lifetime spanning more than thirty-one years, this figure provides concrete proof of how much consumers appreciate the Fiat brand’s innate ability always to deliver the highest level of convenience and space at a price unrivalled in its segment. And as the recent advertising film conceptualises, “you don’t need much to get even more”. The new Tipo line-up comprises three body variants (4-Doors, 5-Doors and Station Wagon) and four trims (Street, Mirror and the new S-Design and Sport), capable of satisfying the needs of a target of widely diverse ages, tastes and mobility needs. The S-Design and Sport are intended for a young, dynamic clientele looking for a strong personality and a sporty character in their car, all features raised to particularly high levels in the Sport trim. The Mirror is conceived for a customer who needs space and modularity and wishes to be connected at all times, while the Street is ideal for young people who want to enjoy all the attractive style, roominess and comfort for which the Tipo family is justly famed. In other words, the model embodies the distinctive features of the Fiat brand: practicality, simplicity and personality. This is why every one of the 500,000 Tipo cars built is a kind of tailored garment, able to satisfy every customer’s mobility needs and tastes.